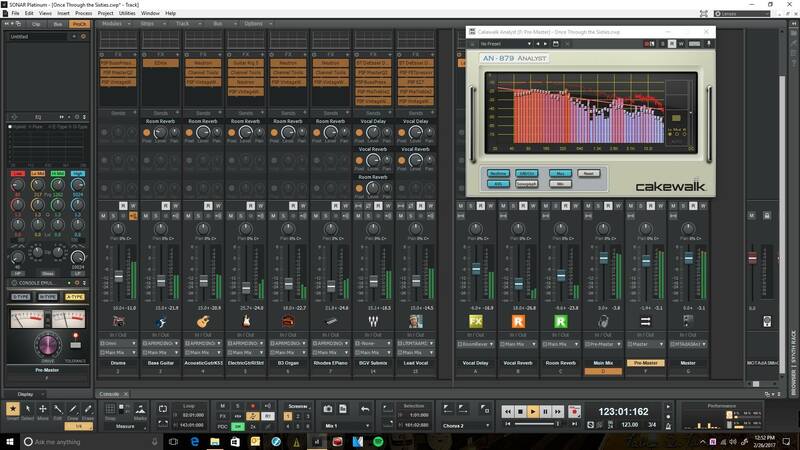 If you’re not a recording musician or recording engineer, using Microsoft Windows-based software to make your recordings, you may be thinking, “huh?” I am both, though, and I’ve been using Cakewalk products to make all my recordings since late 1999, when I purchased Cakewalk Pro Audio 9. Pro Audio 9 was the end of the Pro Audio line, before Cakewalk’s flagship DAW (digital audio workstation) software was rebranded as SONAR. I even beta tested SONAR, and a few other Cakewalk products, from SONAR 2 to SONAR 6. Between 2002 and 2009 I wrote product reviews and other feature articles for the now defunct CakewalkNet.com e-zine, which was targeted primarily at users of SONAR and other Cakewalk products. (You can find PDF “print images” of my reviews, including reviews of SONAR 2 XL, SONAR 7 Producer Edition, and SONAR 8 Producer Edition on the articles page of this website.) I’ve continued using Cakewalk’s SONAR line for my recordings through the “X” line (e.g. SONAR X3 Producer) under Roland’s majority ownership and the “subscribe-to-own” model implemented with the SONAR Platinum flagship offering since Cakewalk was purchased by Gibson. SONAR isn’t as well-known as some of the longer-established products in this area (I mean “Pro Tools” has even become a verb as in, “I’ll just Pro Tools it,” to indicate tweaking performances in software rather than rerecording them — kind of like, “I’ll Google it”), but it has a very large base of Microsoft Windows-based users, owing partly to how long Cakewalk has been around (they recently celebrated their thirty-year anniversary, and some SONAR users have been around since their initial MIDI sequencer offering), partly due to the relative stability of Cakewalk products in the Windows (and, previously, on the MS-DOS) platform (in part because they focus solely on that platform), and partly because SONAR has evolved to be one of the most fully-featured DAWs out there, with particularly good workflow for both traditional and modern music creation and recording. Needless to say, the large base of SONAR users has not taken the news of Cakewalk’s demise well. Well, on the one hand it’s depressing, and a bit scary, if it really spells the end of SONAR as a DAW. On the other hand, I think it is too early to say whether that will truly be the case. Even if Cakewalk wasn’t making money, which I don’t know one way or the other, and Gibson has a history of buying companies then shutting them down (e.g. Opcode), SONAR, and the intellectual property underlying it, not to mention the user base, should have a good deal of value. That could make it attractive to the right sort of company. They’d have to move quickly (and probably already have something in progress to do so), both to have a chance of hiring the best of Cakewalk’s engineers and to not give too much time to lose the user base. (Many users are already talking about defecting to Studio One, for example, and I expect most of the DAW vendors in the Windows environment to make sweet crossgrade offers to SONAR users in the near term. Presonus’ is rumored to be coming Monday, and Steinberg apparently has one coming out tomorrow in Europe and next week in the USA. If those deals are sweet enough on the price front, I might possibly take one or more, not so much because I definitely intend to switch, but partly “for insurance” on that front (i.e. to give me time to learn something before I have to) and partly to educate myself on other DAWs, including whether I might actually end up wanting to switch at some point. (There are a number of “must have” features that I am pretty sure no one DAW, other than SONAR, covers — e.g. Melodyne ARA integration isn’t in Cubase or Digital Performer at the moment, and Studio One has no notation view — so I couldn’t just switch at the moment without severely impacting my workflow. And, of course, I have more than a decade’s worth of projects in Cakewalk file formats, so I need to keep SONAR around to be able to remix those projects in any event, but that doesn’t mean I couldn’t move forward to another DAW with other projects if one works well enough for my purposes.) For example, I have occasionally thought about that possibility after long frustration with SONAR’s staff view because certain projects I do really would benefit from better notation capabilities within the DAW (I have Finale for when I need print quality music, so it is more on the arranging front while working on a recording). As for who could actually purchase Cakewalk’s intellectual property and move it forward, the only significant speculation I’ve heard as yet is Microsoft. In particular, there have been reports that they are working on a DAW of their own (e.g. they posted job listings for a product manager and lead developer at one point, and there was a Groove Music Maker in the video promo for the original Windows 10 Creators Update, but the feature hasn’t seen the light of day in either Creators Update to date). The theory is that they might want a low-end/free product to integrate with Windows plus a premium product to make available to more serious music creators — a la the Apple GarageBand/Logic Pro model. This could help them in positioning their Surface Pro hardware as a serious creation tool, and SONAR is already very well integrated with that. Having to “roll their own” DAW would be a monumental task, not just on the technical front, coming from behind in a market that is saturated with high quality options, but also in terms of trying to attract a user base. SONAR would give them a product that is extremely stable, extremely fully-featured (more so than most DAWs in many, though not all, ways), and that has a very large Windows user base. Maybe even the largest Windows user base for DAWs. Of course, anything that might be in progress at this point, be it with Microsoft or someone else, is likely extremely hush-hush due to non-disclosure agreements and whatever the status of any “deal” may be. And there may be nothing in progress at all, of course. However, for my part, I’m not going to panic at this point. I’ll wait until at least Winter NAMM to do that (thinking that would be a very logical point to announce something, and maybe even show something, since it’s less than two months away). Of course, SONAR will continue to work for the foreseeable future, maybe even for a decade or more. (The biggest concern at this point is what happens with activation if we change computers, be it due to catastrophic hardware failure or just wanting to upgrade, but that may be something that gets resolved one way or another — there is no information on that at this point.) So there is time for things to shake out. However, I think if there is not some kind of announcement within 3 months, or 12 months at most, then I would start actively looking to move to another platform (as opposed to more passively keeping my eyes open, and possibly doing some experimentation, which I am already doing, to a degree, and expect to do more of in the near-to-medium term). Anyway, those are my thoughts at this point. I think there is the possibility that some opportunities could arise from what appears at the moment to be something of a disaster. We’ll just have to watch and see. Meanwhile, I think that, if someone knew enough about Cakewalk’s file formats (and other DAWs’ file formats) to come up with a utility to convert Cakewalk/SONAR projects to other DAWs’ formats, with as minimal loss in functionality as possible (some will be unavoidable, for example due to Pro Channel plugins), there could be a market, even if initially only for people who have already decided to switch platforms.